This article provides information on how to recover iPhone photos and other files from your iTunes backups. This can be particularly useful if you accidentally deleted some iPhone photos or your iPhone is inaccessible, and you wish to check what files can be salvaged from a backup iTunes created when you last connected your device to your computer. iTunes itself does not allow you to extract photos from iPhone backup, as iTunes backups are there in case you need to restore your iPhone from backup rather than retrieve individual files. iBackup Extractor is an application for both Windows and Mac users, which lets you browse and recover iPhone photos and other files from your iTunes backups. In this way, you can retrieve photos you may have deleted or lost from your iPhone, iPod Touch or iPad. Any images contained in your iTunes backup can be restored - iPhone camera images, photos which were messaged to you, or saved to your device using iTunes, or just downloaded from the internet to your device. Download and Install iBackup Extractor if you haven't already done so. Launch iBackup Extractor from your desktop (PC) or launchpad (Mac). Select a backup from the list of detected backups which you would like to access. 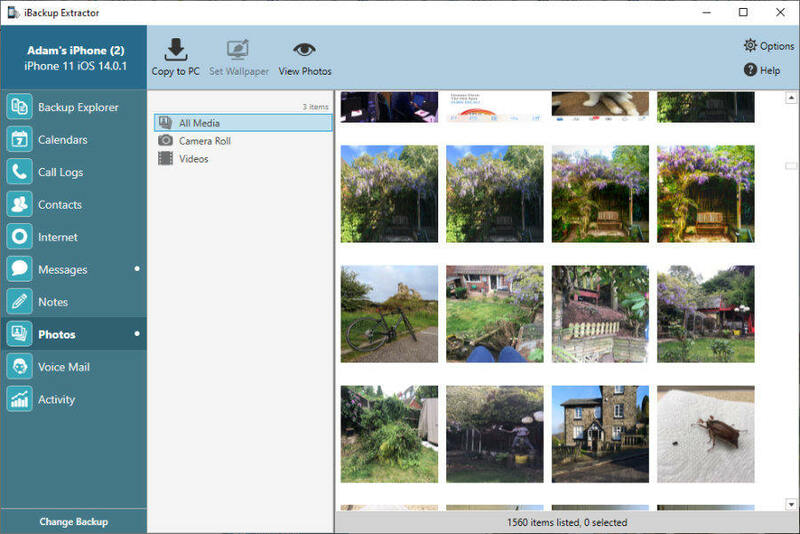 Select the photos you would like to extract, and click "Copy Photos..."
You can use this free download to see what backups are available on your computer, and what images are stored within them. With this demo version of iBackup Extractor, you can even extract 20 items from your iPhone, iPod Touch or iPad backup completely free of charge. Many people ask how to view backed up photos on iTunes. To view your images, firstly select the iTunes backup you wish to extract images from in iBackup Extractor. Once the backup has loaded, click on the "Images" button in the category list. iBackup Extractor displays thumbnails of all the images in your iTunes backup. To view a large version of an image, double click the photo entry in the photo list, or click the "View Photos" button on the Photo tool bar. To return to the thumbnail views, click the Close (X) button at the top of the "View Photos" window. Select the images you wish to copy to your computer and proceed to click the "Copy Photos..." button in the iBackup Extractor images tool bar. This will copy the selected images to a location on your hard drive of your choosing. By default the save location is your Desktop. The images will be saved in JPEG format, in the same quality they were originally saved to your iOS device.